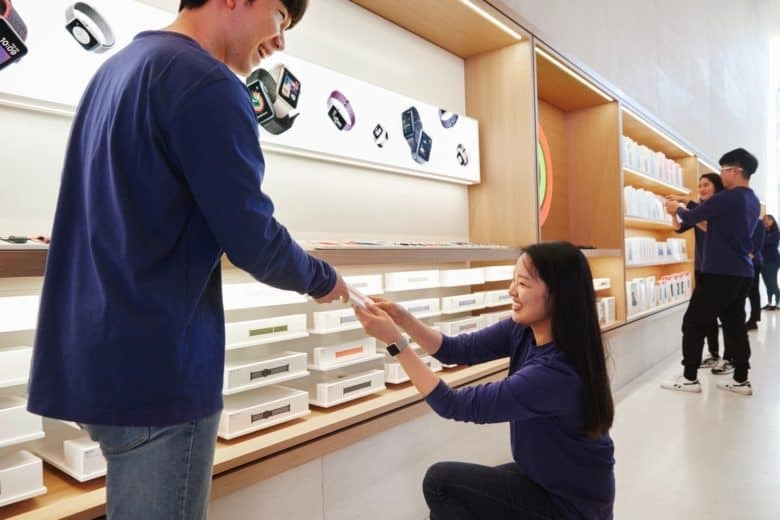 A view from inside Apple's first South Korea retail store. Apple has hit back at claims that it is abusing its power in South Korea by forcing mobile carriers to pay the cost of advertising its devices. The company said that its actions were fully justified, and that selling the iPhone in South Korea wasn’t just advantaging Apple, but also to local mobile carriers. The criticisms of Apple surfaced last year. There were two main accusations. The first is that Apple makes telecom companies follow its own guidelines for adverts, but refuses to share costs. It also supposedly obligates telecom operators to pay for repair costs and display stand installation costs, in addition to ordering a certain amount of products to sell in the country. “During the second round of deliberation, held last week, Apple claimed that its actions were justifiable, claiming the company does have an advantage over local mobile carriers in terms of negotiation, and that it does not have any real power it can exert. The country’s FTC, however, seems to disagree. It says that Apple has a clear advantage over local mobile carriers. Another deliberation on the issue will be held February 20, with a more detailed discussion taking place. Apple could be fined 2 percent of “related revenues.” Worse, this could also open up similar probes in other countries. Whether this counts as a spurious charge is something we’ll no doubt see play out — depending on whether other countries follow Korea’s lead.